Today—April 12, 2012—marks the 51st anniversary of Yuri Alekseyevich Gagarin’s first spaceflight, the first time a human being orbited Earth. In a flight that lasted just 108 minutes, Russian cosmonaut Gagarin traveled in the (very uncomfortable-looking!) space capsule Vostok 1. In recent years, his achievement has been marked worldwide by a festival known as Yuri’s Night, and many events tomorrow will honor him—and all who have followed him into space. I myself will be traveling to Washington, DC this afternoon to celebrate Yuri’s Night with my friends. As I mentioned previously, I have applied to become an astronaut myself. As of today, I’ve learned I’m still in the running, though it will still be some time before I know if I will be interviewed, much less selected for training. Even if I train, there’s still no guarantee I will fly, but it’s still exciting to be part of this process. After all, when I was young, being an astronaut was my second choice of career—after being a stegosaurus, of course. While I take becoming an astronaut a bit more seriously now, I admit my inner 10-year-old is squealing and running laps around the room. While many people have flown into space, that number is still very small compared to the total population. Those who have done so are brave, facing higher immediate risks than most of us will ever experience. 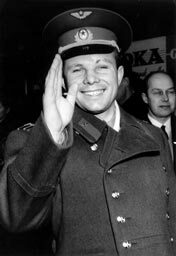 Therefore, Yuri Alekseyevich Gagarin, we salute you!